Yes! this has been utterly discussed to death. But I’ve got to have my say on this. I first started grinding my teeth about on this topic when Laura Kuenssberg, formerly BBC Chief Political Correspondent defected to ITV overnight, switching her Twitter account from BBCLauraK to ITVLauraK. Today, Mehdi Hassan of the New Statesmen has announced he’s joining Huffington Post UK as Political Director in July. There are all sorts of legal opinions on this, but my personal opinion is more simple. I think that when people follow you on Twitter, it’s usually on the basis of something you’ve tweeted and a combination of reading your name and bio. If you state where you work and, particularly, if you include it in your Twitter name, you have an obligation to your followers not to hijack what they’re reading when following your tweets. For example, I chose to follow Laura because of her position as BBC Chief Political Correspondent – hence BBCLauraK. If I had chosen to follow her as an individual, I would’ve happily followed an alternative shared feed. Yes, there is an argument that your Twitter account is yours to do with as you please – but it’s a slap in the face of your followers and your employer by stealing their audience in this fashion. It certainly reflects negatively on you and what you think of your followers. Funnily enough, I was discussing this with my hairdresser the other day. Poaching clients from salons is a huge no-no for stylists. It’s a form of carpetbagging – and ultimately, as word gets round, that stylist will no longer be able to work in that industry. It’s telling now that, having unfollowed Laura the moment she moved to ITV, she now makes zero impact on my life. Perhaps it’s because I don’t consume much news outside the BBC or tech publications, but this is the real impact that her move would have had if she’d not taken her Twitter followers to the BBC’s key competitor. Mehdi now has to think carefully. As @ns_mehdihasan, can he simply change to ‘HuffPoMehdi’ or should he create a new account? If I was the New Statesmen, I’d wonder what audience I’d lose by allowing him to take his followers to HuffPo. Individuals are powerful brands, but these accounts have been grown by their association with their employer’s brands. Personally, I’ve never stated my employer in my profile and have no plans to. Where work stuff is interesting to my followers, I’ll retweet it. And usually, I’m on the shared work account tweeting enough interesting stuff with personality without the need to create a ‘Corporate Josh’. This doesn’t mean I’m not proud of my current association with Melbourne. I just like to a draw a clear line that won’t leave me in a sticky situation if my employment ever changes (I hope it doesn’t!). In any case, a light-touch policy for employers is essential. Agree what you’re going to do if or when the time comes for a staff member to move on – will they hand over the keys like a company car used for work and business? Or will you let them take the audience they’ve grown for you to your competitor? Has Twitter replaced your business card? When we tweaked our visual identity a couple of months ago, whole stacks of little bits of paper scattered around the office suddenly became obsolete. Now that we’ve moved offices, the information on them could be misleading too. I’m referring of course to our business cards: little rectangles of information that have been existed probably since Gutenberg was trying to sell his presses in the 14th century. I suspect the format has changed little too; this 1895 example bears a striking resemblance to some designs I’ve seen just recently. But, just what is the purpose of a business card? I suppose that during organised “networking” events they’re a part of the theatre practised during formal introductions. A well-designed business card should also act as an aide-memoir. And given the fact that we’re a digital business, I’ve been wondering just how useful business cards really are? For me, they’re often bland, forgettable and filed away in a part of my drawer I rarely check. It doesn’t help that cards which try to “stand out of the crowd” often end up being examples of awkward “corporate quirk” or suffer from the deployment of gimmicks like QR codes. At many of the events that I personally attend, a business card is rarely useful. Last week, I stuck my head into Northern Digitals which, to be honest, I go along to as a social event. A lot of my friends work in digital or creative industries and enjoy a pint or two. And a lot of our clients do as well. But because it’s such a social place, I always get chatting with someone new that’s turned up and want to keep in touch with them after the event. But for me, rather than swapping a piece of paper, the best way to keep in touch is by exchanging Twitter usernames. I almost always follow new people that I’ve met in real life and it’s a far more interesting and useful way to keep in touch with someone you might end up doing business with. It also means you can dispense with the empty pleasantries associated with those staid post-networking emails and work with someone as a partner almost immediately. What do you think? Do you have any examples of killer business cards or have you found you’ve done more business through your Twitter account? Drop a comment below. 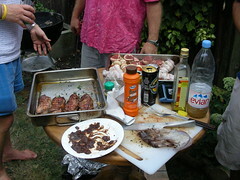 It’s barbecue season in the UK and, in between the downpours, there’s nothing more satisfying than getting out in the sun and charring some meat or veg. Unfortunately, like Christmas, this can mean your eating habits suffer. Whilst attending a barbecue chez @cubicgarden last weekend, I discovered an interesting Twitter based app called Food Feed, which bills itself as an easy and simple way to track your food habits. Using Food Feed is very simple. You just need to go to the Food Feed website and sign-in with your Twitter account. Then all you have to do is follow @having and start tweeting. By tweeting “@having” at the start of your tweets, Food Feed can aggregate all your food tweets in one place, which means you can find them at foodfeed.us/username (like mine). Adding a picture in to your food tweets can make it more memorable or sum up a large meal! You can share this public feed with anyone you want – your doctor, nutritionist or even your mother. It’s a great way to link up with other people eating the same kinds of foods for inspiration or, in my case, to improve my eating habits and put all my food tweets into once place. If your friend on Twitter following @having too, they can see your food tweets without it interfering with your wider stream. Unfortunately, Food Feed doesn’t offer much more than a simple search and aggregation tool. It would be great to see it integrated with an app like Meal Snap that estimates the calories in your meal through a photograph. However, the downside of using Meal Snap is that you have to photo every item of food and the data gets sent to Daily Burn, rather than being quite as simple and easy to share as Food Feed. Check out Food Feed for free and see if it could be useful for you. Twestival is back in Manchester, for the fourth time and, Social Media Manchester are looking to make this one bigger and better than ever before. If you don’t know, Twestival (or ‘Twitter Festival’) is a global fundraising initiative using social media for social good. Twestival is the largest global grassroots media fundraising initiative to date. Through harnessing the power of volunteers and social media, Twestival has raised over £760,000 for 137 good causes since the autumn of 2009. Each Twestival is run on the same date in host cities around the world. Update: I spoke about this at the Social Media Cafe Liverpool – presentation below. Foursquare. It’s the latest hottest thing to blog, tweet and generally foam about. Unfortunately, over-excited use of Foursquare can often simply annoy your Twitter followers. Who cares if you’ve just checked-in at “Don’s pizzeria” or if you’re Mayor of “[hipsterrific bar]”? The real value in Foursquare is not just tweeting where you are, or when you’re Mayor or whether you’ve got the badge that says you’ve been out drinking every night for the last five days (maybe you need to check in at your local AA club). Foursquare is for keeping track of your friends and getting recommendations about good and interesting places to hang out from people you know and trust. When you go to Don’s Pizzeria, tell me why and what you’re doing there. Leave a tip to recommend something (or to remind me to avoid the kebab). 1. Login to your Foursquare account on the web, click Settings and turn-off the default options to send tweets whenever you check-in, become Mayor or unlock a badge. Don’t worry, you can turn these on per check-in. This will stop you losing Twitter followers, bored of incessant check-ins at home, work and the train station. 2. Check-in and add a note each time you do. What are you doing there? What’s good? Are you available to hang out? Many people will get your live Foursquare check-ins through Twitter too (if they don’t have Push-type notifications on iPhone etc). So tweet these, if they’re useful. Again, avoid tweeting mundane places unless you’re looking to hang out with people or at an event. Adding a hashtag helps with the latter. 3. Leave tips. Not cash, but those little notes you can add to places from the Foursquare app. When others check-in, one of the tips pops-up which can help someone make a decision about what to do, where to go or what to have. Ostensibly, tips are positive things, but I have no hesitation in pasting a place if it deserves it. Saving tips that you find when you check-in and browsing nearby tips also means you build-up a collection of “to do’s” that are worth going through on a boring Sunday afternoon. As you become more active on Foursquare, you’ll begin to add up a list of friends. The more users that join, the easier it becomes to find other people and use Foursquare as a way of organising social activities. In Manchester, for example, I find skimming my Foursquare friends list over lunchtime a good way of finding out where other people are and if they’re available to grab a bite to eat. Of course, you can always check-in “off the grid” if you want a bit of privacy. And yes, it is interesting to know who’s the Mayor of a venue. You become a Mayor being by the user to check-in most frequently over the last two months. If a friend is a Mayor, this is a signal to me that he or she goes there lots and, in a sense, endorses it as a venue for whatever goes on there. Checking-in at a venue without actually being there, or really making use of it, is probably somewhat misleading and won’t win me over as your friend. Foursquare is by no means the only location-based social recommendations app out there. I myself was (and still am) an advocate of others, like Gowalla, that frankly have a sexier design and ask users to crowdsource locations, rather than simply buy up a local directory a starting point. Unfortunately, there is a degree of critical mass with Foursquare that goes with the relentless adoration lauded on it by Mashable. This means most of my friends and colleagues have naturally gravitated towards it as a network and that, in turn, makes it more useful for me, to find out what’s going on where. There are methods of checking-in on multiple networks, however I have yet to try these out myself. Remember, Foursquare is all about recommending local places and things to do. This sort of stuff can add value to what your followers see on your Twitter time line, but if you tweet about it too much, it can really turn people off. So check it out and, if you know me, add me as a friend. “collect similar opinions in one place making them more likely to be found by people and companies”. It seems to do this primarily by browsing Twitter and picking up on feelings and emotions expressed about a whole range of topics. This is interesting, as it can flag up when positives or negatives are expressed about a brand, service or individual, making monitoring easier and identifying trends. Unfortunately, it’s well-known that people are more likely to express a negative opinion than a positive one, so whether Amplicate accounts for this is unclear. For some years now, I have been frustrated at the lack of media reporting delivered from the National Union of Students‘ annual policy-making conference. 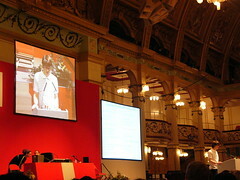 This important event, which sees around 1,000 delegates from higher and further education convene in Blackpool, is free to delegates but attracts a ‘media’/observer charge in excess of £300. While this is reasonable in the context of the overall cost of the conference – which is free to attend for student unions – it makes it difficult for poorly-funded unions and those with competing priorities for ‘student-involvement’ funds, to send dedicated reporters. This means the reporter often has to get involved in the student union election process and be part of the delegation that represents their union at the conference. Arguably, this can affect the quality of reporting by virtue of that person’s involvement. Thankfully, blogging, mobile technology and now, of course, Twitter, means information is getting out from conference a lot quicker. Of course, there’s always been Educationet – probably the first, almost totally open online forum for student politics – but what useful information appeared here at conference was often drowned out by the muck that one had to wade through. 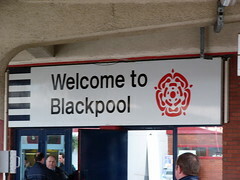 Also, mobile Internet and WiFi hotspots were particularly lacking in Blackpool until the last couple of years. Since I first attended in 2004, the number of blogs about NUS conference has increased dramatically. And last year (2008), for the first time, @ednet tried to provide live Twitter updates from the conference to those receiving texts on their mobiles (including those on Conference floor) – but from a single person’s perspective, it’s not possible to get a feel for the whole event. Still, the feed was good enough to be picked up by CGCU Live! and placed on their front page. Now, with the explosion in Twitter use, there are a number of people – staff and delegates – who updating from the event and I’m going to make an effort to list them all here. There’s a surprising number and hopefully they’ll all use the tag #nusconf to record their tweets! @danielgrabiner – Daniel Grabiner – no idea though! @worldofjr – Andy Hartley – VP Welfare at Manchester Metropolitan Students Union. @ednet – sort of unofficial Educationet.org feed – possibly the nearest thing to a crowd-sourced student media agency, but with minimal filtering. @technicalfault – me – recovering student politician and digital communications producer. Wow. That’s plenty for a Twitter caucus! Please leave a comment or tweet me @technicalfault. 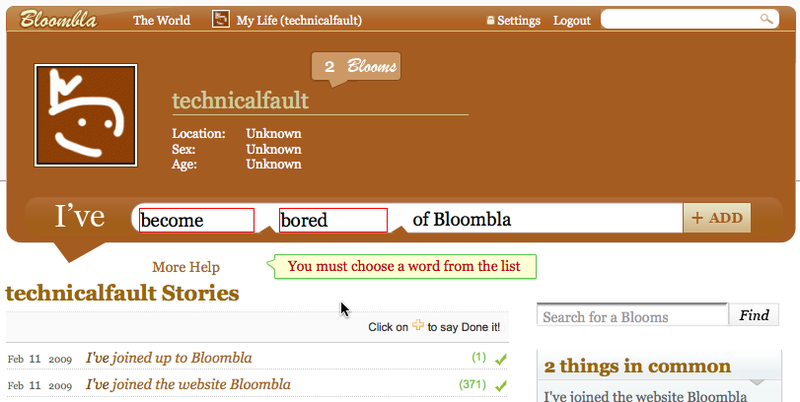 The red boxes insisting I use a verb/format that Bloombla accepts meant I turned off within moments. I know ‘we’ talk about Twitter being mainstream, but the good point was made by George Hopkin that Twitter has 6 million users – Facebook has 150 million users, and growing. To be fair, the elevator pitch lured me in and I did the minimum to reserve my username (90 seconds including first ‘bloom’). But for now, find – and talk to me on Twitter. * Laconica’s open-source approach is quite cool. Makes you wonder – if email protocols had been commercial, would we have so much email or would it have died a death through lack of revenue? See Laconica in action at Identi.ca. I really haven’t had any time to set this up. But I realise that I’ve pointed it out on my Twitter background – so welcome if you’ve come from there, and excuse the mess.